Abacus Telecomm is a holistic telecommunications service provider specialising in the field of least cost routing, VoIP, IP PABX and data solutions. Abacus Telecomm only markets solutions that effectively reduce telecommunication costs. With this in mind, Abacus Telecomm is able to ensure 100% service levels and 100% focus on its clients. BassPhone is a telecommunications company at its core. We provide customized SIP Trunking with flexible Caller ID and DID numbers for inbound calls. We are ready, you can be up and running on the same day; where we are the only provider. We have a couple of easily recognizable numbers for business and residential use. Number porting can be done and is normally completed within a week. We serve South Africa with our Commercial scale Hosted Servers that reside in Johannesburg and Cape Town respectively. We build and own our PBX infrastructure, thus we are not limited by vendor red tape. We are open for integration with systems in industries like hospitality, health, education, information services, etc. for seamless billing and invoicing. The fact that we passed the Yeastar requirements, says it all. Yeastar provides configuration template for ECOTEL, a South African-based SIP trunk provider. More information about ECOTEL is coming soon. 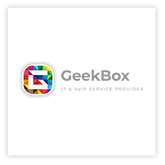 Yeastar provides configuration template for GeekBox, a South African-based SIP trunk provider. More information about GeekBox is coming soon. HD Telecoms Company Dimensions of Quality Customer Services & Company Values! Our Website: https://www.hdtelecoms.co.za/ Reliability – Consistency and dependability – We get it right the first time. We keep our promises. Providing professional client relationships through quality after sales service and support. Imply IT main focus is delivering IT services to Small and Medium sized businesses, that rely on outsourcing their IT & Telephony Support, Imply IT is your IT department. Nextel is a telecommunications and internet service provider absorbed in setting the standard for customer service excellence. At Nextel, we endeavour to deliver light, robust, reliable and scalable telecommunications and connectivity solutions for businesses and residential users alike. In addition, we offer our clients “IT as a service” supplying and maintaining all your connectivity and IT infrastructure while ensuring your equipment and data is always secure. Our main goals are to create simple yet professional services, delivered by some of the most talented and conscientious people in the industry. Not only will we personalise your experience, but will ensure you have a dedicated partner for all your IT and communication needs. Reach us at www.nextel.co.za to view all we have on offer and learn more about our SMB and enterprise solutions. Wanatel (Pty) Ltd is a licensed IECNS and IECS (No. 0308IECNS/MAR/09 and No. 0308IENS/MAR/09) telecommunications provider based in Cape Town (South Africa). Wanatel provides Communications as a Service (CaaS) solutions, specializing in Quality VoIP and Unified Communications solutions. With offices in South Africa and France, we provide global services to an international client base. As a business VoIP provider, we created world class products and service offerings to our clients. We aim to achieve this through constant innovation and working with cutting edge technologies, as well as attention to our clients’ needs. We believe that nothing is impossible, and that one shoe does not fit all.